Jatri Orain is a 44-year-old widow of the same village. Three years ago, her husband died of excessive consumption of alcohol, leaving her with nine children to and barely any source of income. While four daughters were married off early, she was still responsible for five other children who were still at school. At the insistence of a Soochna Seva team member, she agreed to file a nomination form for enrollment for the Pig Development Scheme under the Animal Husbandry Department. A few months later, her application was selected and she now has a little extra income support. Forty-six-year-old Chawa Orain lives in Bhandra village under Kuli panchayat of Ranchi, Jharkhand, with his 40-year-old wife and six children. As a big family, with five minor children, life has been tough for Chawa who earns a minimum labour wage and manages his small piece of land. It was a few months ago that he first met a Soochna Sevak when he was visiting a camp for free gas connections. It was at this camp that Chawa, who is categorised under a BPL family, was informed about the Animal Husbandry Department’s Pig Development Scheme. The Soochna Sevaks helped him fill out the nomination form after an initial verification. Four months later, Chawa was selected for the scheme. He now has an additional source of income, and his family has a new occupation to contribute to. In a nearby village called Kundi lives 65-year-old Sabila Khatoon. She has been living with her oldest son and his wife ever since Sabila’s wife abandoned her for a second wife. 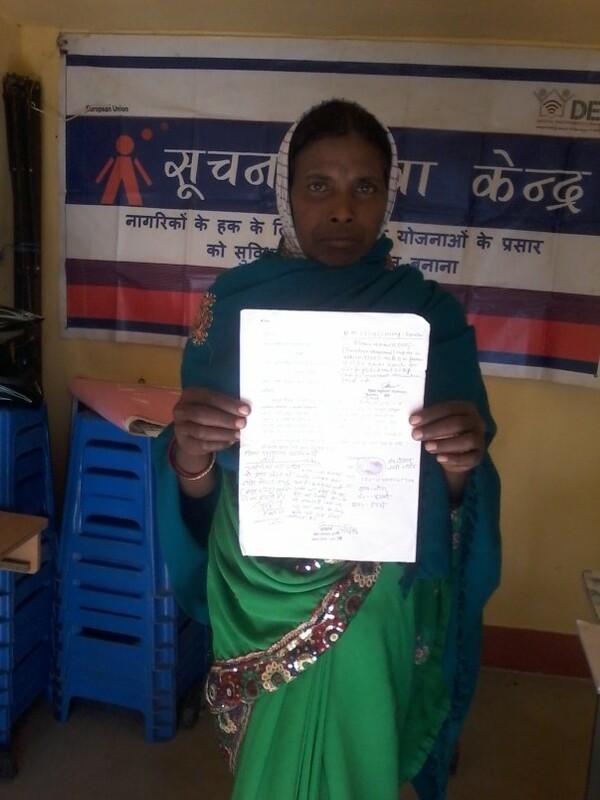 Sabila has been a frequent visitor of the nearest Soochna Seva Kendra. She often visits the centre to know about any scheme that she or her family can apply for in an effort to improve their livelihood. Most recently, she was encouraged by a Soochna Sevak to register for a Labour Card that would provide her with various health and life insurance, besides housing and wage benefits. Thirty-four-year-old Urmila Kujur lives in Semra village of Ranchi district with her husband, three children and in-laws. Both Urmila and her husband are hardworking, diligent persons who earn their living as daily wage labourers. However, their income was not enough to sustain the family. She fears that soon her children will have to drop out of school because she would not be able to meet their needs. It was with this fear that she visited a nearby Soochna Seva Kendra to seek help. The Soochna Sevaks found her to be a suitable candidate for the state government poultry farming scheme and registered her for the same. Two months later, her application was approved and she received Rs. 25,000 in her bank account to start a poultry farm. Soochna Seva is an initiative aimed at facilitating information about government schemes and entitlements, and enabling access to the same for rural communities in an effort to support, strengthen and enhance capacities of grassroots communities to access and avail information and entitlements in critical areas of health, education, social & financial inclusion, livelihood and employment. It is supported by the European Union.